Braces are almost much a rite of passage for many young people nowadays. Having your teeth straightened by braces is also becoming a popular treatment choice for adults, who missed the boat when they were in their teens. The outcomes are usually excellent, but an ongoing issue for patients is often an increased difficulty cleaning the oral environment during the period the orthodontic appliances are bonded to their teeth. This can result in gingivitis, which is a plaque induced inflammation of the gums, making them bleed. One of the most common questions asked by patients is, ‘so how do you get rid of gingivitis with braces?’ In this article I will therefore outline how you can keep your gums healthy whilst the teeth are getting shuffled around into perfection! Should My Gums Be Sore? Often people will mistake the first few days of discomfort for something being wrong with their gums, when in fact it is just the normal initial response your teeth make to being put under pressure by the braces. This should subside after several days. If the discomfort is constant and ongoing however, this points to more chronic problems which are not related to the braces directly. One possible cause for pain and bleeding could be because of gingivitis. Because braces make it more difficult to remove debris from around your teeth, they can be conducive to the build up plaque, which can often be essentially invisible to the untrained eye. It is your body’s inflammatory response to this plaque which causes them to bleed. Luckily the initial stages of gingivitis are reversible. Braces can irritate the gums, but this can be heightened by hormonal changes associated with stress, pregnancy and puberty. Speak to your dentist in confidence if you feel the reasons why your gums are bleeding is about more than just your braces. The first thing that patients will notice when they try to floss is that the ‘can’t get the floss down between their teeth to the gums’. This is because the metal wire prevents the floss from breaking through the contact point between the teeth. get your dentist or orthodontist to show you the technique which allows you to pass the floss under the wire. A special type of floss is useful in this instance, and it’s called Su﻿pe﻿rfloss. 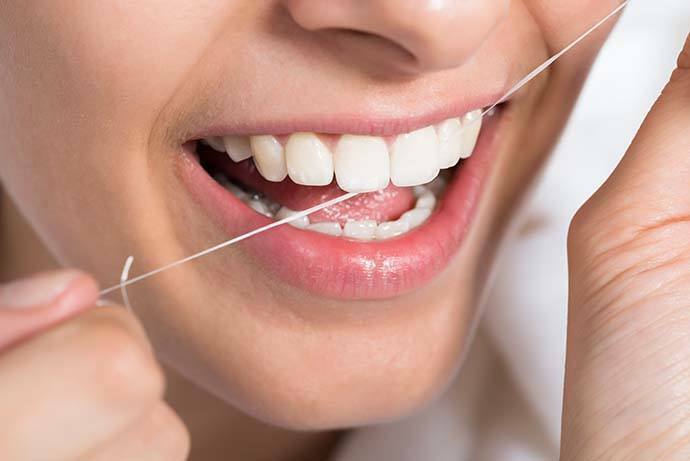 The floss fills up the whole space around the tooth, gum and brace. My patients with braces swear by these little devices. you can buy them here. They belong to a class of oral hygiene products called ‘interdental cleaners’ because they go in between the teeth, and they also go under the orthodontic wire. They are like little pipe cleaners which you can bend to get in hard to reach places. They come in different colors which indicate how thick the brush is. Buy a multipack initially and then you can figure out what size fits your mouth best. The beauty of them is they can be taken anywhere, and you only need one hand, so you can discreetly clean your teeth on the go! It will just look like you are using a toothpick. It is always important to clean your teeth, but especially so when you are wearing braces. Here are a few tips to make sure you are brushing correctly during your orthodontic treatment. Use an electric toothbrush if you are still struggling. (I would recommend the Colgate c350 pro clinical). If your dentist thinks the gingivitis needs a bit of extra help to clear up, then they might prescribe a Mouth-rinse called Corsodyl. This will help reduce inflammation from your gums, but it isn't for long term use as it can very slightly stain your teeth. Whilst this stain is very simply removed, it is not ideal, so your dentist should prescribe and advise you on how long to use it. Sometimes the only thing that will shift the stubborner plaque and calculus is a thorough professional clean from either you dentist or hygienist. Don’t be afraid to ask even if you don’t think you are due a clean, as this is an excellent way to reduce the effects of gum bleeding. Straight teeth is a desirable outcome from orthodontic treatment, but it needn’t be coupled with damage to your gums. If you do one thing for your teeth whilst wearing your braces i would recommend augmenting brushing and flossing with the use of picksters. attending for regular hygiene appointments. routinely cleaning around the braces with floss/interdental brushes. using the right brushing schedule and technique. using special mouth rinse as prescribed buy dental healthcare practitioner. There are many more strategies for getting rid of Gingivitis - but be sure to check with your health professional or dentist before giving each a go! If you have any questions or comments, let us know, we would love to hear from you!